I've never made grilled cheese. Well...if I have...I haven't made grilled cheese since I was like 11, anyway. Anyway, I've never been a huge fan of it. I know-I like bread, I like cheese, why don't I like grilled cheese?? Probably because I've only ever had it with wonder bread and those little packaged slices of American cheese. And uh...to me...that's not uber appetizing. 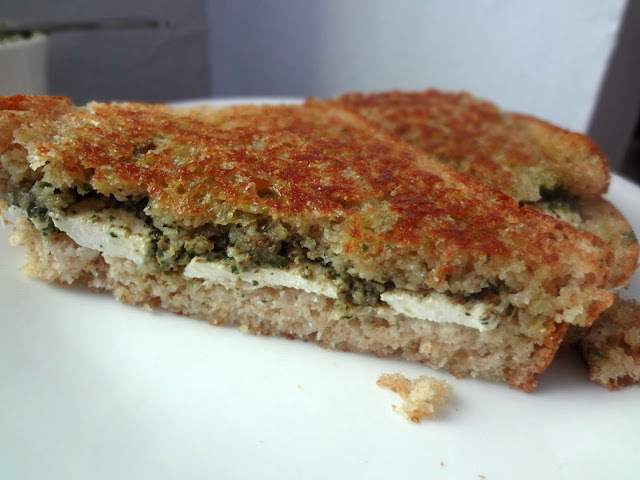 But lately I've been dreaming of slices of good, homemade bread, grilled with brie (mmm so buttery), or...well...this sandwich. So one day I made myself some pesto. And English muffin bread. And then I bought some mozzarella. And made this. I think I have officially hopped aboard the grilled cheese bandwagon, guys. It's like me. It's like "Oh hey I'm an All American girl next door comforting thing, grilled cheese!" But then also "Oh I'm also kinda Italian and maybe a little fancier and a little bit of a surprise, not as predictable as you thought, huh? "....I'm actually not sure if that's the best description of me...it's definitely a good one for this sammy though. Comfort and sophisticated, all at the same time. Mmmm mmm good. 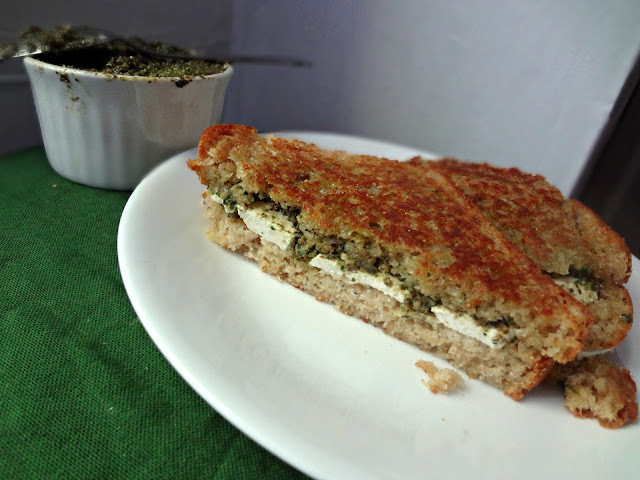 From Simply Scratch "'The Special' Grilled Pesto & Mozzarella Cheese Sandwich"
Heat a pan over medium low heat. 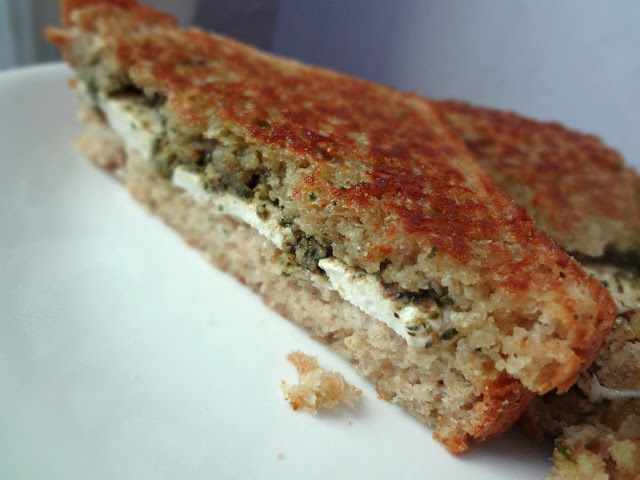 Spread butter evenly and thinly on 1 side of each slice of bread. Lay 1 slice of bread, butter side down, on the heated pan. Place the slice mozzarella on top of the bread, and then spread about a tablespoon of pesto over it. Top with the second slice of bread (butter side up). Once golden, flip and cook until the other side is also golden and the cheese has gotten gooey and melt-y. I want one of these now.